Achieving the correct networking setup is crucial to a successful CloudStack installation. This section contains information to help you make decisions and follow the right procedures to get your network set up correctly. CloudStack provides two styles of networking:. Basic For AWS-style networking. Provides a single network where guest isolation can be provided through layer-3 means such as security groups (IP address source filtering). Advanced For more sophisticated network topologies. This network model provides the most flexibility in defining guest networks, but requires more configuration steps than basic networking. Each zone has either basic or advanced networking. Once the choice of networking model for a zone has been made and configured in CloudStack, it can not be changed. A zone is either basic or advanced for its entire lifetime. The following table compares the networking features in the two networking models. The two types of networking may be in use in the same cloud. However, a given zone must use either Basic Networking or Advanced Networking. Different types of network traffic can be segmented on the same physical network. Guest traffic can also be segmented by account. To isolate traffic, you can use separate VLANs. If you are using separate VLANs on a single physical network, make sure the VLAN tags are in separate numerical ranges. This section contains an example configuration of specific switch models for zone-level layer-3 switching. It assumes VLAN management protocols, such as VTP or GVRP, have been disabled. The example scripts must be changed appropriately if you choose to use VTP or GVRP. The following steps show how a Dell 62xx is configured for zone-level layer-3 switching. These steps assume VLAN 201 is used to route untagged private IPs for pod 1, and pod 1’s layer-2 switch is connected to Ethernet port 1/g1. The Dell 62xx Series switch supports up to 1024 VLANs. Configure all the VLANs in the database. VLAN 201 is the native untagged VLAN for port 1/g1. All VLANs (300-999) are passed to all the pod-level layer-2 switches. The following steps show how a Cisco 3750 is configured for zone-level layer-3 switching. These steps assume VLAN 201 is used to route untagged private IPs for pod 1, and pod 1’s layer-2 switch is connected to GigabitEthernet1/0/1. Setting VTP mode to transparent allows us to utilize VLAN IDs above 1000. Since we only use VLANs up to 999, vtp transparent mode is not strictly required. VLAN 201 is the native untagged VLAN for port GigabitEthernet1/0/1. Cisco passes all VLANs by default. As a result, all VLANs (300-999) are passed to all the pod-level layer-2 switches. The layer-2 switch is the access switching layer inside the pod. It should trunk all VLANs into every computing host. It should switch traffic for the management network containing computing and storage hosts. The layer-3 switch will serve as the gateway for the management network. The following sections contain example configurations for specific switch models for pod-level layer-2 switching. It assumes VLAN management protocols such as VTP or GVRP have been disabled. The scripts must be changed appropriately if you choose to use VTP or GVRP. The following steps show how a Dell 62xx is configured for pod-level layer-2 switching. VLAN 201 is used to route untagged private IP addresses for pod 1, and pod 1 is connected to this layer-2 switch. All ports are configured the same way. All VLANs (300-999) are passed through all the ports of the layer-2 switch. The following steps show how a Cisco 3750 is configured for pod-level layer-2 switching. Configure all ports to dot1q and set 201 as the native VLAN. By default, Cisco passes all VLANs. Cisco switches complain of the native VLAN IDs are different when 2 ports are connected together. That’s why you must specify VLAN 201 as the native VLAN on the layer-2 switch. All deployments should have a firewall protecting the management server; see Generic Firewall Provisions. Optionally, some deployments may also have a Juniper SRX firewall that will be the default gateway for the guest networks; see “External Guest Firewall Integration for Juniper SRX (Optional)”. Protect the Management Servers. NAT and port forwarding should be configured to direct traffic from the public Internet to the Management Servers. Route management network traffic between multiple zones. Site-to-site VPN should be configured between multiple zones. To achieve the above purposes you must set up fixed configurations for the firewall. Firewall rules and policies need not change as users are provisioned into the cloud. Any brand of hardware firewall that supports NAT and site-to-site VPN can be used. Available only for guests using advanced networking. CloudStack provides for direct management of the Juniper SRX series of firewalls. This enables CloudStack to establish static NAT mappings from public IPs to guest VMs, and to use the Juniper device in place of the virtual router for firewall services. You can have one or more Juniper SRX per zone. This feature is optional. If Juniper integration is not provisioned, CloudStack will use the virtual router for these services. The Juniper SRX can optionally be used in conjunction with an external load balancer. External Network elements can be deployed in a side-by-side or inline configuration. Supported SRX software version is 10.3 or higher. Install your SRX appliance according to the vendor’s instructions. Connect one interface to the management network and one interface to the public network. Alternatively, you can connect the same interface to both networks and a use a VLAN for the public network. Make sure “vlan-tagging” is enabled on the private interface. Record the public and private interface names. If you used a VLAN for the public interface, add a ”. [VLAN TAG]” after the interface name. For example, if you are using ge-0/0/3 for your public interface and VLAN tag 301, your public interface name would be “ge-0/0/3.301”. Your private interface name should always be untagged because the CloudStack software automatically creates tagged logical interfaces. Create a public security zone and a private security zone. By default, these will already exist and will be called “untrust” and “trust”. Add the public interface to the public zone and the private interface to the private zone. Note down the security zone names. Make sure there is a security policy from the private zone to the public zone that allows all traffic. Note the username and password of the account you want the CloudStack software to log in to when it is programming rules. Make sure the “ssh” and “xnm-clear-text” system services are enabled. Make sure all VLANs are brought to the private interface of the SRX. IP Address: The IP address of the SRX. Username: The user name of the account on the SRX that CloudStack should use. Public Interface. The name of the public interface on the SRX. For example, ge-0/0/2. A ”.x” at the end of the interface indicates the VLAN that is in use. Private Interface: The name of the private interface on the SRX. For example, ge-0/0/1. Number of Retries: The number of times to attempt a command on the SRX before failing. The default value is 2. Timeout (seconds): The time to wait for a command on the SRX before considering it failed. Default is 300 seconds. Public Network: The name of the public network on the SRX. For example, trust. Private Network: The name of the private network on the SRX. For example, untrust. Click Global Settings. Set the parameter external.network.stats.interval to indicate how often you want CloudStack to fetch network usage statistics from the Juniper SRX. If you are not using the SRX to gather network usage statistics, set to 0. Configure Cisco ASA 1000v firewalls. You can configure one per guest network. Use Cisco ASA 1000v firewalls to create and apply security profiles that contain ACL policy sets for both ingress and egress traffic. Use Cisco ASA 1000v firewalls to create and apply Source NAT, Port Forwarding, and Static NAT policy sets. CloudStack supports Cisco VNMC on Cisco Nexus 1000v dvSwich-enabled VMware hypervisors. Cisco ASA 1000v firewall is supported only in Isolated Guest Networks. Cisco ASA 1000v firewall is not supported on VPC. Cisco ASA 1000v firewall is not supported for load balancing. When a guest network is created with Cisco VNMC firewall provider, an additional public IP is acquired along with the Source NAT IP. The Source NAT IP is used for the rules, whereas the additional IP is used to for the ASA outside interface. Ensure that this additional public IP is not released. You can identify this IP as soon as the network is in implemented state and before acquiring any further public IPs. The additional IP is the one that is not marked as Source NAT. You can find the IP used for the ASA outside interface by looking at the Cisco VNMC used in your guest network. Use the public IP address range from a single subnet. You cannot add IP addresses from different subnets. Only one ASA instance per VLAN is allowed because multiple VLANS cannot be trunked to ASA ports. Therefore, you can use only one ASA instance in a guest network. Only one Cisco VNMC per zone is allowed. Supported only in Inline mode deployment with load balancer. The ASA firewall rule is applicable to all the public IPs in the guest network. Unlike the firewall rules created on virtual router, a rule created on the ASA device is not tied to a specific public IP. Cisco VNMC requires the vservice command to be available on the Nexus switch to create a guest network in CloudStack. Configure Cisco Nexus 1000v dvSwitch in a vCenter environment. Create Port profiles for both internal and external network interfaces on Cisco Nexus 1000v dvSwitch. Note down the inside port profile, which needs to be provided while adding the ASA appliance to CloudStack. For information on configuration, see “Configuring a vSphere Cluster with Nexus 1000v Virtual Switch”. Deploy and configure Cisco VNMC. For more information, see Installing Cisco Virtual Network Management Center and Configuring Cisco Virtual Network Management Center. Register Cisco Nexus 1000v dvSwitch with Cisco VNMC. For more information, see Registering a Cisco Nexus 1000V with Cisco VNMC. 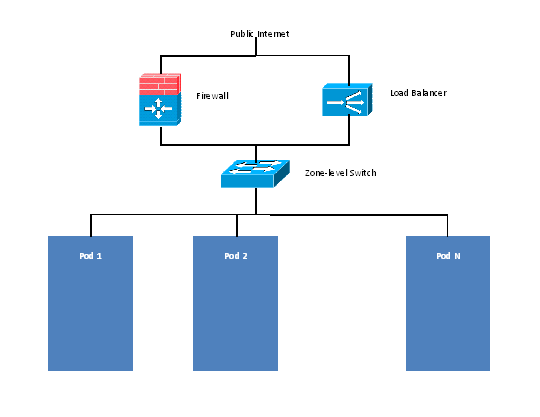 Create Inside and Outside port profiles in Cisco Nexus 1000v dvSwitch. For more information, see “Configuring a vSphere Cluster with Nexus 1000v Virtual Switch”. Deploy and Cisco ASA 1000v appliance. For more information, see Setting Up the ASA 1000V Using VNMC. Typically, you create a pool of ASA 1000v appliances and register them with CloudStack. Ensure that you add ASA appliance in VNMC mode. Port profiles for the Management and HA network interfaces. This need to be pre-created on Cisco Nexus 1000v dvSwitch. Internal and external port profiles. The Management IP for Cisco ASA 1000v appliance. Specify the gateway such that the VNMC IP is reachable. Register Cisco ASA 1000v with VNMC. After Cisco ASA 1000v instance is powered on, register VNMC from the ASA console. Ensure that all the prerequisites are met. See “Adding a VNMC Instance”. Add a ASA 1000v instance. See “Adding an ASA 1000v Instance”. Create a Network Offering and use Cisco VNMC as the service provider for desired services. See “Creating a Network Offering Using Cisco ASA 1000v”. Create an Isolated Guest Network by using the network offering you just created. Host: The IP address of the VNMC instance. Username: The user name of the account on the VNMC instance that CloudStack should use. Host: The management IP address of the ASA 1000v instance. The IP address is used to connect to ASA 1000V. Inside Port Profile: The Inside Port Profile configured on Cisco Nexus1000v dvSwitch. Cluster: The VMware cluster to which you are adding the ASA 1000v instance. Ensure that the cluster is Cisco Nexus 1000v dvSwitch enabled. Supported Services: Use Cisco VNMC as the service provider for Firewall, Source NAT, Port Forwarding, and Static NAT to create an Isolated guest network offering. The network offering is created. You can reuse an ASA 1000v appliance in a new guest network after the necessary cleanup. Typically, ASA 1000v is cleaned up when the logical edge firewall is cleaned up in VNMC. If this cleanup does not happen, you need to reset the appliance to its factory settings for use in new guest networks. As part of this, enable SSH on the appliance and store the SSH credentials by registering on VNMC. System config has been modified. Save? [Y]es/[N]o:"
CloudStack can optionally use a Citrix NetScaler or BigIP F5 load balancer to provide load balancing services to guests. If this is not enabled, CloudStack will use the software load balancer in the virtual router. Set up the appliance according to the vendor’s directions. Connect it to the networks carrying public traffic and management traffic (these could be the same network). Record the IP address, username, password, public interface name, and private interface name. The interface names will be something like “1.1” or “1.2”. Make sure that the VLANs are trunked to the management network interface. After the CloudStack Management Server is installed, log in as administrator to the CloudStack UI. The installation and provisioning of the external load balancer is finished. You can proceed to add VMs and NAT or load balancing rules. CloudStack can use a load balancer to provide a virtual IP for multiple Management Servers. The administrator is responsible for creating the load balancer rules for the Management Servers. The application requires persistence or stickiness across multiple sessions. The following chart lists the ports that should be load balanced and whether or not persistence is required. Even if persistence is not required, enabling it is permitted. In addition to above settings, the administrator is responsible for setting the ‘host’ global config value from the management server IP to load balancer virtual IP address. If the ‘host’ value is not set to the VIP for Port 8250 and one of your management servers crashes, the UI is still available but the system VMs will not be able to contact the management server. The public Internet must not be able to access port 8096 or port 8250 on the Management Server. The Management Servers communicate with each other to coordinate tasks. This communication uses TCP on ports 8250 and 9090. The console proxy VMs connect to all hosts in the zone over the management traffic network. Therefore the management traffic network of any given pod in the zone must have connectivity to the management traffic network of all other pods in the zone. The secondary storage VMs and console proxy VMs connect to the Management Server on port 8250. If you are using multiple Management Servers, the load balanced IP address of the Management Servers on port 8250 must be reachable. The secondary storage NFS export is mounted by the secondary storage VM. Secondary storage traffic goes over the management traffic network, even if there is a separate storage network. Primary storage traffic goes over the storage network, if available. If you choose to place secondary storage NFS servers on the storage network, you must make sure there is a route from the management traffic network to the storage network. When external firewall integration is in place, the public IP VLAN must still be trunked to the Hosts. This is required to support the Secondary Storage VM and Console Proxy VM. With Advanced Networking, separate subnets must be used for private and public networks. The Management Servers communicate with XenServer hosts on ports 22 (ssh), 80 (HTTP), and 443 (HTTPs). The Management Server and secondary storage VMs must be able to access vCenter and all ESXi hosts in the zone. To allow the necessary access through the firewall, keep port 443 open. The Management Servers communicate with VMware vCenter servers on port 443 (HTTPs). The Management Servers communicate with the System VMs on port 3922 (ssh) on the management traffic network. CloudStack Management Server communicates with Hyper-V Agent by using HTTPS. For secure communication between the Management Server and the Hyper-V host, open port 8250. The Management Servers communicate with KVM hosts on port 22 (ssh). The Management Servers communicate with LXC hosts on port 22 (ssh). To collect usage data for a guest network, CloudStack needs to pull the data from an external network statistics collector installed on the network. Metering statistics for guest networks are available through CloudStack’s integration with inMon Traffic Sentinel. To construct the query, CloudStack determines what guest IPs were in use during the current query interval. This includes both newly assigned IPs and IPs that were assigned in a previous time period and continued to be in use. CloudStack queries Traffic Sentinel for network statistics that apply to these IPs during the time period they remained allocated in CloudStack. The returned data is correlated with the customer account that owned each IP and the timestamps when IPs were assigned and released in order to create billable metering records in CloudStack. When the Usage Server runs, it collects this data. On your network infrastructure, install Traffic Sentinel and configure it to gather traffic data. For installation and configuration steps, see inMon documentation at Traffic Sentinel Documentation. In the Traffic Sentinel UI, configure Traffic Sentinel to accept script querying from guest users. CloudStack will be the guest user performing the remote queries to gather network usage for one or more IP addresses. Click File > Users > Access Control > Reports Query, then select Guest from the drop-down list. On CloudStack, add the Traffic Sentinel host by calling the CloudStack API command addTrafficMonitor. Pass in the URL of the Traffic Sentinel as protocol + host + port (optional); for example, http://10.147.28.100:8080. For the addTrafficMonitor command syntax, see the API Reference at API Documentation. For information about how to call the CloudStack API, see the Developer’s Guide at CloudStack API Developer’s Guide. direct.network.stats.interval: How often you want CloudStack to query Traffic Sentinel. In the external networking case, every VM in a zone must have a unique guest IP address. There are two variables that you need to consider in determining how to configure CloudStack to support this: how many Zone VLANs do you expect to have and how many VMs do you expect to have running in the Zone at any one time. Use the following table to determine how to configure CloudStack for your deployment. Based on your deployment’s needs, choose the appropriate value of guest.vlan.bits. Set it as described in Edit the Global Configuration Settings (Optional) section and restart the Management Server.